I recently received an invitation to start using Comcast’s new online DVR scheduler. 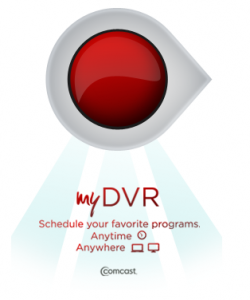 The myDVR manager from Comcast finally provides a service that AT&T U-verse and Tivo users have long held dear, and until now, the missing service had been another problem in the string of complaints about Comcast. Thankfully, the service is here and next time you’re stuck in a meeting or bank robbery you can be confident that the overdone ESPN episode of an over-glorified NBA player’s free agent signing is available for viewing later. Go to www.fancast.com/mydvr and follow the links to activate your myDVR service. You’ll be taken through a few pages to sign in and check availability in your area. Finally, you’ll choose to activate your DVR which may take up to 24 hours. Using the myDVR Manager online is very simple and easy to use, and Comcast will enjoy getting more visitors on their fancast site. On the site you’ll find a TV guide similar to what you see on your TV. You can look up shows by channel and time plus filter by popular groups like Movies, Sports, and HD. Once you find a show you want to record, select it and then click “Record Episode” or “Record Series”. Next you will find an interface similar to that on your DVR box where options on how often to record and what to keep are available. The myDVR Manager button (below) is always available and lets you manage the priority of shows and see what upcoming recordings you have. Best of all, the Comcast myDVR service is available via the Comcast Mobile app on the iPhone and iPad. The app has a guide similar to the one online where you select the shows you want to record and then “Schedule a Recording”. The mobile services are essential to making this service great and have been executed well. I can’t believe I’m thanking Comcast for something, but this is a service I plan to use. What about you? Let other readers know in the comments below.